Do you need professional office space? 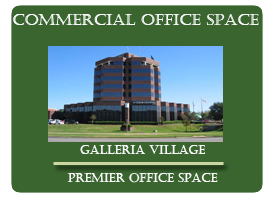 We have about 6,000sqft available on the top floor of the Galleria Village Tower. It can be divided. The views are the best in town! We also have 3,345sqft available on our first floor with amazing natural light flowing throughout it. Contact Us to move your business into a true professional office building. Do you need a large office or retail space? 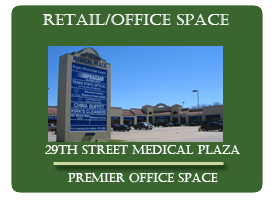 We can make 13,427sqft available at the East 29th Street Medical Plaza near St. Joseph's Hospital. It would be excellent for your office or retail purposes. Click Contact Us to learn more. Do you need a small office or retail space? We have one space which is 1,200sqft available on the side of the Village Foods building which faces East 29th Street. Visibility is outstanding as this is one of the busiest intersections on all of Bryan/College Station. Click Contact Us to learn more.